"I think tulle wedding gowns are gorgeous." The down side is that tulle is one of the most delicate of wedding dress fabrics. You need to handle it with "kid gloves." So the following information is to help you make an informed decision as to whether this is the perfect wedding dress for your wedding. If it is you will now know how to work with it. One thing you need to know is tulle fabric pick up hairs, lint and string. It traps them between layers and will take some time to pick out. So if you have pets, you definitely want to keep your gown in the wedding storage bag. Also, some wedding locations would not work well for tulle wedding gowns. If your wedding will take place outdoors this wedding dress fabric will grab on to grass. Dust, dirt and sand will get in the layers of the hem... Not a pretty sight! Hemming your dress high enough to not touch the ground about 1 ½ - 1 ¾ inches above the floor will help keep the dress from dragging the ground so much. As for the train... some brides I have worked with will keep it bustled when moving around in the gown outside. Small cramped locations are not good either. The tulle fabric will catch on furniture, like chairs and tables. So be careful when navigating around the wedding and receptions location. Tulle fabric tends to rip easily. This sometimes calls for repairs to be made even before wearing your gown for your wedding. Wedding dress tips: From my experience . . . this dress is "not the best choice" for "some personalities". If you are a person who likes everything nice and neat, everything in its place type, then this may not be the style bridal gown for you. Also alterations for tulle wedding dresses can be expensive. Try to find out up front what your wedding alterations costs will be. Plan your budget accordingly. 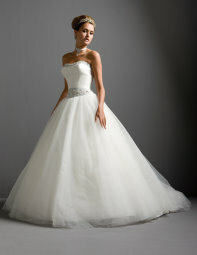 If you need information on how to repair or alter your tulle wedding dress click here. When purchasing tulle wedding gowns you need to check yours out carefully before you leave the bridal store. You will not receive any sympathy if you leave the store, get home and then notice a rip in your bridal gown. I have had this happen to a bride who came to me to have her gown altered. "When I began to fit her and started to spread out the train, both the mom and I saw a large ripped section about 3 layers down from the top." "They said they kept the dress in the bag and felt it must have been that way when they left the bridal shop. I ended up having to cut the layer out. We determined that since the gown had many layers it wouldn't be missed." You cannot bring a bridal gown back to the store and expect a refund or exchange. Its too late to prove it happened in the store. "So inspect all layers carefully before you have it altered and/or leave the wedding dress shop with it."